We’d love your help. Let us know what’s wrong with this preview of Economic Jihad by Jo M. Sekimonyo. Economists are not all evil, few might have had good intentions. Most of recent economists' bibles don't bring anything new to the table other than beautiful tables. Instead of reviving the neglected debate around socio-economic inequality, their misfires add to the cacophony that already existed and their childish solutions to socio-economic injustice, either Robin Hood or Give a dog a bone approaches, make their books as useful as a paperweight. To ask other readers questions about Economic Jihad, please sign up. Apart from the terrible state of the economy what brought you to write the book? I have not read your book yet but am interested in doing so, hopefully it will not be to long winded, technical or boring! Jo Sekimonyo Sincere apology for missing your question. I made this book easier to read than fat torching. Each chapter debuts with quotes giving you a clue of…moreSincere apology for missing your question. I made this book easier to read than fat torching. Each chapter debuts with quotes giving you a clue of what to expect and have interjected “interludes” between batches to awaken young readers with short attention spans, and to add a zest of a novel for the literary enthusiasts. I shall confess to folks who expect colorful charts and numbers, and to economists addicted to ketamine (mathematical models), I am sincerely sorry that I have let you down. Yet one thing is for sure, at no time I did pull my punches. Oh yeah, and I did not waste my energy on the discourse of 20th century economists. You do no need to sample manure in order to confirm it is manure; the stench of falsehoods is sufficient to discern it as such. What demon possessed me to write this book? Well after walking by, giving my spare change to people blinded and asphyxiated by misery, in every country I have been lucky or cursed to travel to, I asked myself repeatedly, what else can I do?! Stories about inequality have been told on and on. Nevertheless, I decided to stir the debate onto a new path, let hope that I succeed. This is a bold book written by the author, Jo M. Sekimonyo, on a topic which most of us hesitate to touch, let alone read or write. All that has gone wrong with global economy is said in a forceful, thought provoking, matter of fact way . He has taken all the happenings of the world and presented it without holding back any punches. The author has proved that every good decision taken by the politicians and leaders has the ugly side, the real side, the truth. He has written every sentence, backi This is a bold book written by the author, Jo M. Sekimonyo, on a topic which most of us hesitate to touch, let alone read or write. All that has gone wrong with global economy is said in a forceful, thought provoking, matter of fact way . He has taken all the happenings of the world and presented it without holding back any punches. The author has proved that every good decision taken by the politicians and leaders has the ugly side, the real side, the truth. He has written every sentence, backing it up with evidence, and these are not just present day evidence but all that has happened long ago too. That shows the intense and extensive research Sekimonyo has done, to write a book which shows the reality of economy, which is failing as of today, the dark effects of capitalism happening all over the world. He has taken personal examples and weaved that into his book. Though the author Sekimonyo looks at all the countries where economy failed its people, he does concentrate a bit more on the US economy or rather the fall of the economy and the various scams, as he was residing in USA for a few years. I could personally relate to the author as I have also been asking the same questions about the rich men in India, who lives in a 20-storey building and posh residences which overlook both the sea on one side and the slums on the other. Yet, it doesn't affect any of the leaders, industrialists and politicians. It is the rich who are becoming richer at the cost of poor or the middle class as they are called in India. I am not an economics expert, but author has made me think about my foray into capitalism when I buy jewelry or when I change mobile phones frequently, do I really need to do that....???? We have all lived the selfish way for many centuries and this book shows the mirror to humanity or rather to the lack of basic humanity. As the author has pointed out the facts which are happening throughout the world, each one of us, in any part of the world, can relate to the global capitalism. He has correctly said that the so called economists of the world somehow don't see, or they are not able to find a human solution for its less fortunate, or perhaps they don't want to find out a solution as that means coming down from the ivory towers. He has pulled the masks off all the leaders and philosophers and the economists including the scientists and showed their real faces. Immediately after downloading the Kindle eBook version of this work, I began the task of unpacking the author’s message. That message begins in earnest: quotes from champions of the poor and destitute, anecdotes from a well-traveled memory, a critical view of Nelson Mandela. The author, who proclaims himself a former “hippy lunatic idealist,” need not add well-educated to his list of self-descriptive adjectives, as his pedantic word choices and erudite illustrations speak for themselves. Discuss Immediately after downloading the Kindle eBook version of this work, I began the task of unpacking the author’s message. That message begins in earnest: quotes from champions of the poor and destitute, anecdotes from a well-traveled memory, a critical view of Nelson Mandela. The author, who proclaims himself a former “hippy lunatic idealist,” need not add well-educated to his list of self-descriptive adjectives, as his pedantic word choices and erudite illustrations speak for themselves. Discussion of concepts like “heterodox economics” (schools of economic thought outside the mainstream) and a casual reference to the “Codex Gigas” (the largest extant medieval manuscript in the world), signal to the reader that only the studious need continue. The author unapologetically implores readers to consider an alternative to “the prevailing brutal economic system, which is Capitalism,” and its “delusional McCarthyist” proponents, while pointedly rejecting both Communism (Marxism) and Socialism as well. Alluding to the discourse of 20th century economists as “manure,” the author sets out to persuade readers to abandon their comfort zones, creating a work which is both academic in subject matter and detail, yet is also an engaging, passionate narrative devoid of any objective pretense. One could dismiss the author’s argument as that of a wide-eyed, hippy, lunatic idealist if not for the surprising eloquence of his prose and the painstakingly gathered evidence he provides to support his often first-hand observations of the world in which we live. Let me first say, Jo M. Sekimonyo’s writing style is truly entertaining. While he is unquestionably very intelligent, it is the author’s heart for the invisible poor and destitute of this world, passion to make a difference, and personal humor-laced stories, which kept me engaged in what would otherwise have been, for me, an entirely too cerebral subject matter. That said, Sekimonyo’s work challenged me, it “cranked up my brain” and forced me to think about what I believe, or accept, about the world economy – and more importantly, the people in it. Fell so in love with the Bio – Had to Read the Book! “Who is Jo M. Sekimonyo? Congolese roots, American fermented, and globally bottled Ideological queer (nonconformist). If you ever run into me, within 5 minutes you will know that I am fiercely opinionated and allergic to badly patched arguments and people who stand complacent in the face of two major issues that pierce my heart: social injustice and economic inequality. I can be seen as eccentric, because I refuse to listen to music tha Fell so in love with the Bio – Had to Read the Book! See what I mean? Absolutely irresistible! So begins one of my favorite chapters: I See Poor People. (a take on one of the author’s favorite movies: I See Dead People by M. Night Shyamalan (an admiration we share!) In this chapter, Sekimonyo dares to challenge the Mandela régime by setting aside the 27 years he spent in a labor camp, to examine the ultimate outcome of the whole Apartheid debacle. A bold move – few have ever broached, but he does it brilliantly, with conviction and concise knowledge that just may open your eyes to a subject that is difficult for the world to examine. Like the poor in America (including ex-military survivors occupying cardboard boxes they call home) living among the wealthy in a country that heralds itself as “The Greatest Nation in the World” ... “their are none so blind as they who refuse to see.” The author notes that greatness should not be judged by what one says – but by ones’ actions! WOW! A belief he learned from his Grandparents –“their mantra”, he states. (Would loved to have known them!). I am so impressed by this author’s ability to peel back the layers of shyte (ooops, can I say that?) by cleverly disguising his observances with humor clad piercing rounds that go straight to the heart. Jo M. Sekimonyo’s unconventional writing technique is so refreshing – like having a conversation with an old friend, that I could go on - an on - and on; but to do so would ruin the discovery awaiting you upon reading it for yourself. That would be unforgivable of me – so reluctantly, I will end this review as I began it: Fell so in Love with the Bio – Had to Read the Book! In a word – Compelling! Cast Away: Economic Jihad by Jo M. Sekimonyo ... a great read anytime, especially on this cold February night. Thanks Jo! The beginning of the book is very boring. Do yourself a favour and skip a couple of chapters in. While the traveller is obviously well-aware of the world out there, their inclination to over-preach their experiences, making the reader feel as though the circumstances visited are directly their fault does not sit well with the reader. In short, I really don't like being accused of something I have no involvement in, and this book has a lot of that. Other than that little peeve, the story is good, The beginning of the book is very boring. Do yourself a favour and skip a couple of chapters in. The book by Sekimonyo took me by surprise. There's nothing boring about this book. It's sort of the kind which you may hate or love but won't be able to ignore. What struck me most is the poetry in his words as he describes the plight of the poor. The book affected me in multiple ways— primarily by making me aware of the stark contrasts in this world and then giving a solution to solve the problem. It certainly is quite different from anything I've read so far but I am impressed with the author's The book by Sekimonyo took me by surprise. There's nothing boring about this book. It's sort of the kind which you may hate or love but won't be able to ignore. What struck me most is the poetry in his words as he describes the plight of the poor. The book affected me in multiple ways— primarily by making me aware of the stark contrasts in this world and then giving a solution to solve the problem. I don't really have anything else to say about this book. Except maybe, Bravo! Funny Parts: Actually, it has a few. Global Economics and the Governmental Structures Controlling It! A blend of thought-provoking quotes and a passionate desire to change the suppressive economic practices that encourage poverty. This book has merit and inspires the reader to take a hard look at the world around them. Though I appreciated what the author was saying and doing, this was a difficult read for me - it is most definitely not a "grab a cup of coffee and blanket to read wi Global Economics and the Governmental Structures Controlling It! A blend of thought-provoking quotes and a passionate desire to change the suppressive economic practices that encourage poverty. This book has merit and inspires the reader to take a hard look at the world around them. Though I appreciated what the author was saying and doing, this was a difficult read for me - it is most definitely not a "grab a cup of coffee and blanket to read with the cat" book - much deeper. The reason I found it hard to stay with had nothing to do with how it was written or the content, per se. No, for me, personally, it was because I lack interest in economics so it read more like a textbook from an editorial view. The anthropological view of this book was more interesting to me than the governmental and economic scripts. Still, it left me feeling sad and frustrated. Despite the author's suggestions for change, real life doesn't work that way. I felt little and powerless though I believe the author's intent was to wake me up and encourage me to act. I am certain my current disappointment in humanity hasn't helped my emotional presence while reading this book either. I realize some may argue that is my issue and not the authors, and that my star rating should be higher. I disagree. The star rating is based on opinion. My opinion of this is book is that it's good, but it is NOT one I would recommend to a casual reader. I WOULD, however, recommend it to readers interested in Humanities. We can undeniably feed the entire planet. There are enough resources for the 9 billion individuals inhabiting the world. But it is how these resources are managed that is the culprit of hunger and poverty in developing countries and even in some regions of prosperous nations. And Capitalism is the reaper that makes the rich, richer and greedier and the poor, poorer and hungrier. It’s time to open our eyes and realize that the current socio-politico-economic system we function in just does not wo We can undeniably feed the entire planet. There are enough resources for the 9 billion individuals inhabiting the world. But it is how these resources are managed that is the culprit of hunger and poverty in developing countries and even in some regions of prosperous nations. And Capitalism is the reaper that makes the rich, richer and greedier and the poor, poorer and hungrier. It’s time to open our eyes and realize that the current socio-politico-economic system we function in just does not work, if it ever did at all. And tweaking it will only put band-aids on very grave struggles. Only a new socio-politico-economic philosophy that cares for the welfare of all beings can make a genuine difference in the world. Look out for Ethosism. In Cast Away: For These Reasons: Economic Jihad, Jo M. Sekimonyo enlightens us readers in eloquent yet simple language about the pitfalls of Capitalism now and its barbarism then. The effects of its wrongdoing are not only felt locally, but are traveling fast and far like in Chaos Theory. Except in this case, it is not a butterfly that flutters from one hot spot to ship out a hurricane in another hot spot. It could be a billionaire taking part in fraud activity of his company, thinking he will never be caught. But he is. And his company goes bankrupt. Because it is a huge international corporation, the consequences are devastating around the globe. Sekimonyo is adamant about the lack of tangible help from increasing minimum wages. Time and again, he repeats that it will not solve anything. Likewise, education is critical and should be widespread, but education alone cannot help us salvage our biosphere. Sekimonyo proposes and explains about Ethosism. A philosophy that is still a work in progress, but that has positive possibilities and could potentially eradicate Capitalism if not exorcise it into a better socio-politico-economic system. The most important fact is that it intends to ameliorate the lives of people who have it very low, but who deserve only the best. I tremendously enjoyed reading Cast Away: For These Reasons: Economic Jihad. It was educational without being textbookish. It was interactive, as well, in the sense that Sekimonyo would oftentimes address us readers, humor us, and make us cry. It felt like I was truly involved and my involvement stuck to the end. Also, having him share bits and pieces about his life and his passions were very refreshing and poignant. I got to know him more as a human being, which is not something a biography could ever pull off. Lastly, I thought him adding quotations from famous people was a nice touch, and definitely did foretell what was incoming in the next parts of each chapter. The interludes were a lovely transition of powerful and feeling poems from occasional overload of information and frenzied feelings we experienced throughout the reading. 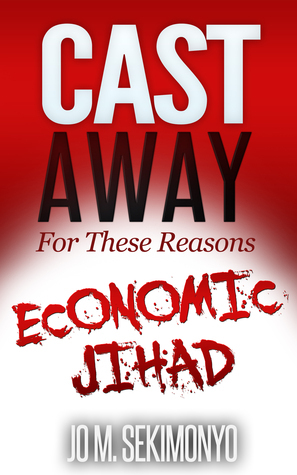 CAST AWAY: FOR THESE REASONS: ECONOMIC JIHAD takes a bold approach to educate the reader on how poverty is quickly becoming a worldwide problem. Often in society, we get busy with our everyday lives and forget the horrors that are taking place in our own country and across the world. Through the authors words he has traveled the continent to see firsthand the devastation that is taking place on this earth. He uses vivid and powerful words to show the reader how bad society has become. Through his stories, there was one that hit home and had turned into a life changing experience for this reader. It involved what is going on the clothing industry in Bangladesh. From this revelation, I will never be able to purchase another garment that is manufactured in that country. Jo M. Sekimonyo can be best described as a realist, a philosopher of socioeconomic inequality, a humanitarian, and a person that is not afraid to speak his own mind. Through CAST AWAY: FOR THESE REASONS: ECONOMIC JIHAD he challenges mankind to wake up and realize that evil exists and is taking place right around them. Unless we wake up and change the way we are living our lives our existence is one that is danger of being destroyed. To say that this book gave me a reality check in the world’s most pressing problems is an understatement. Once I started reading, I was unable to put it down, after I finished reading the last page, I kept thinking back to all that the author had explained. I recommend this book to anyone who wishes to take an in-depth look at the devastation that is quickly consuming this nation. I can guarantee that after you finish with this book you will have gained a fresh perspective on life. This book has the thought provoking enrichment that allows a person to see the world with new eyes of self-awareness. Social injustice and economic inequality are issues that I deeply care about. I have worked like a demon to help push petitions in relation to these issues and each representative has fallen flat each time after hitting government steps. I’m frustrated at our global system and have given up all hope in Capitalism as it lacks compassion & practical sense. The author’s witty shots and extensive knowledge of our deteriorating society clearly shows that he is passionate about issues affecting the Social injustice and economic inequality are issues that I deeply care about. I have worked like a demon to help push petitions in relation to these issues and each representative has fallen flat each time after hitting government steps. I’m frustrated at our global system and have given up all hope in Capitalism as it lacks compassion & practical sense. The author’s witty shots and extensive knowledge of our deteriorating society clearly shows that he is passionate about issues affecting the majority. The author even went to the extent of referring to my homeland by mentioning the unfortunate event that occurred to the Moriori (a tapu race) of the Chatham Islands of New Zealand, which definitely took me by surprise. Even the mention of Moriori among some locals today can strike a nerve. I for one have found the read inspiring even though it made my blood boil & put me through an emotional rollercoaster, I just couldn’t let myself put this book down once I started. It brought up emotions of my past while travelling through the back streets of Asia. The notion of Ethosism is highly intriguing that I’ve opt-in to pre-ordering the authors next book “Ethosism Manifesto”. Just ask yourself these few questions. Is our greed for monetary success absolutely, necessary? Is having Capitalists exploit working class and accumulating wealth benefiting our society as a whole? Why are capitalists allowed to accumulate wealth when the poor so desperately need the basics such as nourishment, medical care, clothing and shelter? It seems criminal how children are dying on the street while the 1% profit & accumulate excessive wealth. This author is bold and determined to challenge the status quo and I highly recommend the read, no matter what your background. This book is great for the more intellectual type of book clubs. There are many thought-provoking points the author makes which lay a foundation for introspection or group discussion. The author gives a great many of examples of social inequalities that are present in the US. He is not preaching communism or Marxism or socialism. He is simply giving insight into the problems with capitalism- I particularly was compelled by his argument on what capitalism is based on and how barbaric it is. You m This book is great for the more intellectual type of book clubs. There are many thought-provoking points the author makes which lay a foundation for introspection or group discussion. The author gives a great many of examples of social inequalities that are present in the US. He is not preaching communism or Marxism or socialism. He is simply giving insight into the problems with capitalism- I particularly was compelled by his argument on what capitalism is based on and how barbaric it is. You may not agree with him and I don’t think that is the author’s angle in writing this. Simply see the facts, uncover more, consider another view and think about the world around you. Come up with your own opinion- although you don’t need to have one on everything. Maybe you will be interested in making capitalism better after reading! The writing is fresh, crisp, and reads smoothly. It may take a chapter to get into, but it is worth the effort. As a former political science student, I highly recommend it to other students in related fields. Bring it to your professor’s attention, too! Looking forward to reading more from this author. I read this book from the perspective of someone who knows little of economy and that got me lost most of the time. I eventually got used to the ultra-rapid pace with a dozen references per phrase but since I'm not familiar with most of what was being discused, most of the time I found myself saying 'ok, if you say so why not'. Definitely not recomended for everyone! I don’t suggest just reading this book; I encourage sharing it with friends, family, and colleagues to initiate a conversation. Before you turn it away because of the title, I strongly urge everyone to consider engaging with Sekimonyo’s discussion about the faults of capitalism and a new alternative. As a literature nerd born and raised in Middle of Nowhere, Northern California, I am by no stretch of the imagination an economist. Frankly, I had to research a good portion of what Sekimonyo was talking about as he got into the more “economics-heavy” sections. That being said, Sekimonyo’s humor, passion, and sometimes bitter voice kept me engaged in a subject which I may have otherwise shied away from due to my ignorance. Despite having to research as I read, Sekimonyo does well in including personal narratives, history, and analogies with a minimum amount of economic jargon and graphs so that a novice like me could still follow along. I’m guessing that I’ll have to re-read it a couple times before fully being able to explain Sekimonyo’s capitalism alternative but his grievances with the current economic system were well-put, thought-out, and, in my opinion, very justifiable. Not everything he discussed was news to me but I appreciate him forcing me to look at people such as Bill Gates, Bill Clinton, and Nelson Mandela from another perspective. It’s also getting me to think about the argument for raising minimum wage in a new light. This book starts with a heart-wrenching tale which quickly sunk its teeth into me, but I will admit that much of the first half of the book went rather slowly. Hang in there! His sense of humor will keep you reading far past when you should be asleep (happened to me two nights in a row) and his conversational tone will make you wish that you were able to chat with him face-to-face. More importantly, the book really started to pick up steam for me around Chapter VIII, so you just have to ride the rest out and make sure you understand what you’re reading along the way. Cast Away is a very thought-provoking and exciting book that makes you bring down all the walls in your mind, that restrict you to blaming mere capitalism for the poor distribution of wealth that exists today. The author takes a completely new and unique standpoint on this problem, and without giving too much away, I'd just like to say that it will blow your mind. This is a book that truly has you gripping the edge of your seat and will probably leave you in a mouth-gaping trance for a while as t Cast Away is a very thought-provoking and exciting book that makes you bring down all the walls in your mind, that restrict you to blaming mere capitalism for the poor distribution of wealth that exists today. The author takes a completely new and unique standpoint on this problem, and without giving too much away, I'd just like to say that it will blow your mind. This is a book that truly has you gripping the edge of your seat and will probably leave you in a mouth-gaping trance for a while as the direction of events in the storyline becomes clearer and clearer. This is a book that gives you insight into various other factors that contribute to this major economical problem. And, not to mention, the brilliant climax of the story will leave you gasping. Economics isn’t an easy topic to understand. There are vastly different theories about what makes for a successful economy that ranges from capitalism to socialism with a number of stops in between. Like many other theories, the application is never perfect, so the results are always flawed. In the US, we tend to think that capitalism is best, but when you look at it, it’s just as bad as many others. The author shares his thoughts on how capitalism has damaged not only our country but other count Economics isn’t an easy topic to understand. There are vastly different theories about what makes for a successful economy that ranges from capitalism to socialism with a number of stops in between. Like many other theories, the application is never perfect, so the results are always flawed. In the US, we tend to think that capitalism is best, but when you look at it, it’s just as bad as many others. The author shares his thoughts on how capitalism has damaged not only our country but other countries as they try to impose (or we try to impose) our policies on their lives. He covers topics including the bank bailouts, the massive plant closures in the auto industries, over-consumption, and the disparity between rich and poor. Before you think that the book is entirely about the US, it’s not. The author gives many examples of problems in other countries including those in South America, Europe, Asia, and Africa. This book really opened my eyes to the problems in the world today – in our country and in others. I’ve always believed that there wasn’t really anything inherently wrong with capitalism but after reading this book, I’m seeing that it can be dangerous than I thought for reasons I never really considered. As a young adult, I briefly felt that Marxism was the answer to our socio-economic problems, but have realized that isn’t the answer any more than capitalism and the author briefly touches on the reasons why. Political Economy Author/Activist. Congolese roots, American fermented, globally bottled, pleasure and agony canvasser, and an Ideological Mambi (nonconformist). A machetero deliberately confronted by corybantic circumstances of existing. I fondly pride myself on having a rhinoceros tough skin, safeguarding me against the usual flapdoodle. I am fiercely opinionated and allergic to poorly patched a Political Economy Author/Activist. Congolese roots, American fermented, globally bottled, pleasure and agony canvasser, and an Ideological Mambi (nonconformist). A machetero deliberately confronted by corybantic circumstances of existing. I fondly pride myself on having a rhinoceros tough skin, safeguarding me against the usual flapdoodle. I am fiercely opinionated and allergic to poorly patched arguments. I delight in wreaking havoc on psychological and cerebral closed-mindedness just as any form of fanaticism or fallacy like a poltergeist. The older I get, no matter how much I try, the more I fail in gagging my anguish and anger over parochialism in all its shapes and forms. I cannot just bring myself to accept intolerance or prejudice as life.